How do I attach a lens to my case? Use the white line on the side of the lens and align it with the polished line on the side of the photo case. Drop the lens down into place and rotate the lens a quarter turn clockwise. Make sure you do not over rotate as you could break the stops built into the case. My iPhone has two lenses built in, can I attach a lens to both of them? 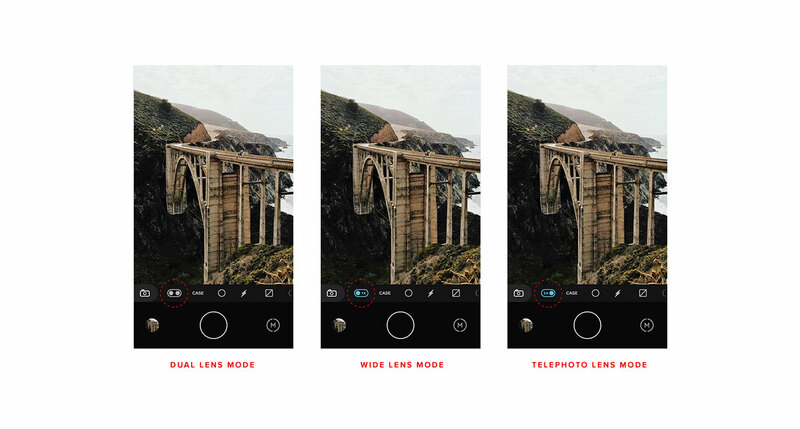 If you want to use the tele lens and you are getting a black image in the native camera app this is because iPhone automatically switches back and forth between the 2 iPhone lenses. When zooming (and maybe other parameters like low light) the phone will switch to the other lens on its own, and it's black because it's covered by the Moment lens. A way to work around this is to use the Moment Camera App. Using our app will allow you to select the iPhone lens you want the camera to use and not automatically switch between the two. If your camera view is black, tap the icon circled in the graphic to switch to the other lens mode. The setting that controls this can be seen in bellow. How do I attach a lens to a case with a vertical lens mount (iPhone X, XS, XS Max, XR, Samsung S9, S9+, OnePlus 6, etc)? Mounting lenses on the iPhone X is slightly different than other phones we support due to this device having vertically aligned lenses. To mount your lens, decide which of the iPhone’s lenses you’d like to mount on (the top is the standard lens, the bottom is the tele lens), then place the lens in this area of the mount. Use the white line on the side of the lens and align it with the polished line on the top of the photo case. When done correctly the Moment logo will appear to line up with the alignment dash on the case.